Talon has been one of my most anticipated books for this year so I was extremely excited to receive an advanced copy from Harlequin Teen via Netgalley. The story follows Ember and Dante Hill as they learn to adapt to human life away from what they have learned from Talon but both have differing views on how they should be behaving; it was a concept I really enjoyed, especially when it came to Ember’s reluctance. Talon lives by strict rules which dragons are expected to abide by but when truths are revealed by a rogue things aren’t what they seem and Ember’s rebellious side comes to light. Also thrown into the equation is the Order of St George who are trained to hunt the dragons, this aspect is one I found quite interesting, especially with the love interest fighting for this side. ** A wonderful main character with a defiant personality, she knew what she wanted and went for it despite the ramifications. ** The premise is original and intriguing; I loved reading about the dragons and the group that hunted them. ** Julie Kagawa’s brilliant story-telling and engaging writing. ** I would have liked more history about the dragons and more scary dragon times in general. ** A love-triangle – Riley the Dragon & Garret the slayer, I am not a fan of this trope at all and in this book I don’t really feel it was needed. My hopes are on Riley though; the whole Dragon/Human I didn’t find appealing. ** Garret, I found him to be flat and under-developed along with some other characters who lacked depth. ** Slow in some parts and rapid pacing at others. 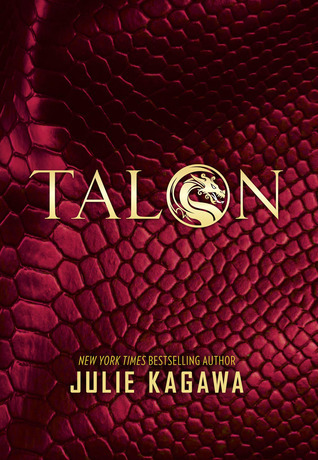 I wish I could say I loved Talon as I have other JK books but this one was just ok for me, it was a nice set-up for the rest of the series and I will definitely be reading the next book. Thank you to Harlequin Teen via Netgalley for the opportunity to read and review Talon. Hm it does seem like this one could fall flat in certain areas. I'm sorry it didn't completely work for you. It was also one that I was really looking forward to reading so I'm disappointed already and I haven't even read it yet lol. Thanks Alexa :-) It was a nice start to the series but I really wanted more Dragons and for it to be devoid of the dreaded love-triangle. Great review. Thanks for sharing. I was hoping this one would be better. Ugh, love triangle. Some I like, most I hate. I do love this cover but I don't think I've ever read a dragon book before and it makes me nervous. Darn it! I was really hoping to make this my first Julie Kagawa book, but your 3-star review has me reconsidering. I love dragons, so I'm disappointed that the author didn't focus on them more, and ANOTHER love triangle. Argh! However, that cover is so pretty, and I need to give this writer a go sooner or later... Maybe the story will be better in audio.